Our first day of Bushwise Field Guides was a bit nerve wrecking. Meeting new people, seeing new faces and the start of making new friends. Quite tricky having to learn all their names, thank goodness for name badges. The orientation and welcome included the Bushwise staff going over the rules and regulations and most importantly, that no-one is to wonder alone in the dark. So, we had to learn together even though we don’t know each others background. Hearing the ‘bush’ music from the different frog and toad species in the dam that night made us all feel so good and so far we have all settled in very well. After all the rain we have seen many different arthropods at night, especially scorpions. 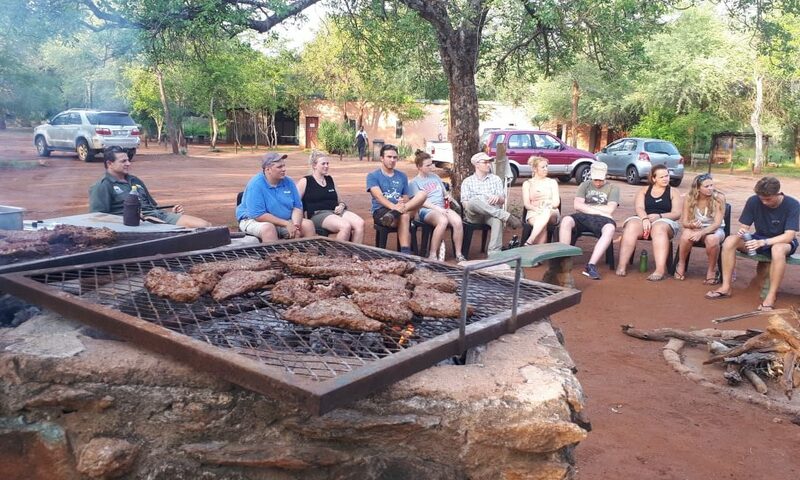 We also has a welcoming braai under a Marula tree where we were able to get to know each others backgrounds and reasons for why we are all doing this course. Our first lecture from Gerard was very informative. 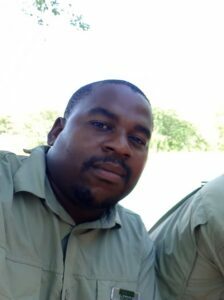 It was about how to be an ethical guide and what requirements are needed from an individual to be able to make it in this field guide industry. You must be able to have respect for nature and a responsibility towards the guests ‘experience’ without damaging the natural environment. 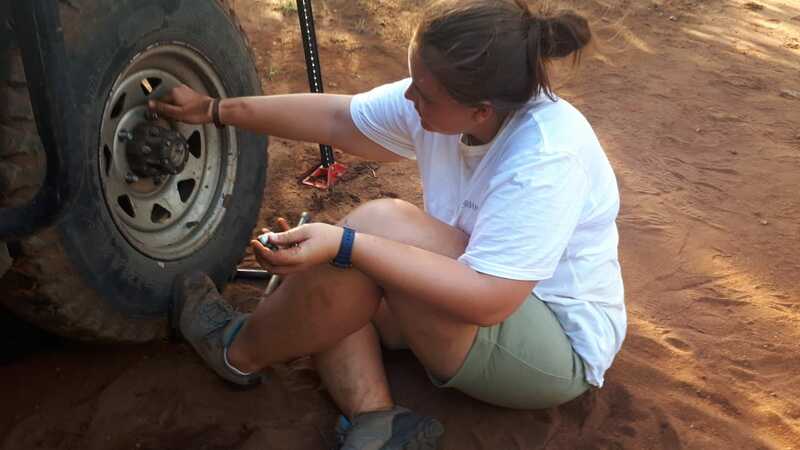 Later we did a bit of tyre changing practice. They were very heavy but after the techniques were shown, not too much strength is needed. I for one am quite happy because when I get a puncture I know I will be able to change it on my own. I have a feeling that we are in good hands from these experienced trainers. So far, I am loving a every single moment and am very thankful to be part of the Class of January 2019. 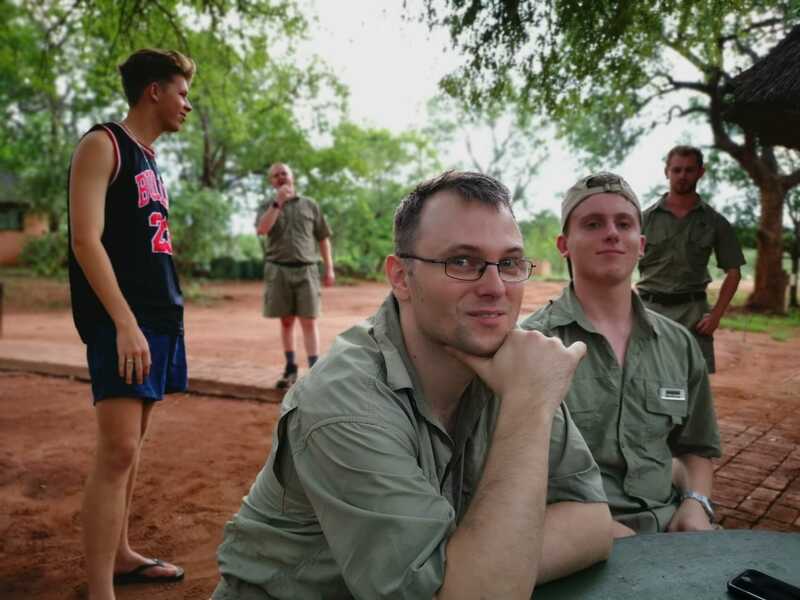 We ventured off campus to get our uniform from Khaki Fever in Hoedspruit and after that we went to do the Reptile Orientation course at Kinyonga Reptile Park. There we learnt about snakes, lizards and crocodiles. Travelling in an open vehicle to and from town, felt awesome until a dung beetle hit me on my forehead. It was so funny and James could not stop laughing. He was sure to keep reminding my of how unlucky that dung beetle was. Then we met Oom Jan! 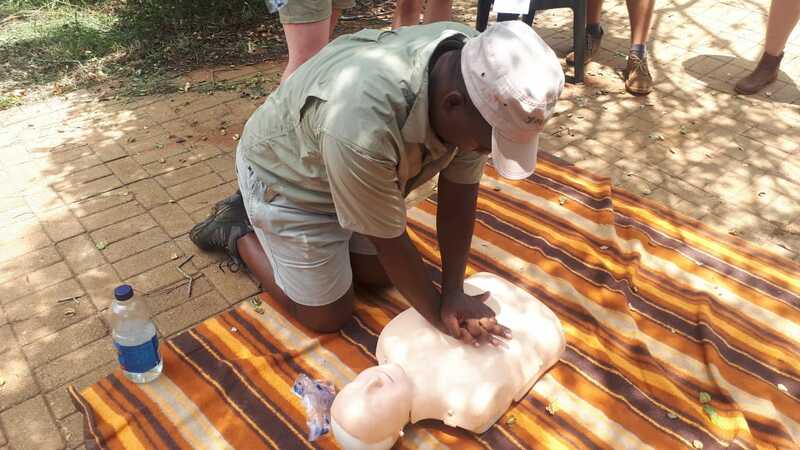 He was our trainer for the Wilderness First aid course, level 1 and 2. Now we are familiar with different scenarios that could happen and how to save someone in need of a help in various situations. 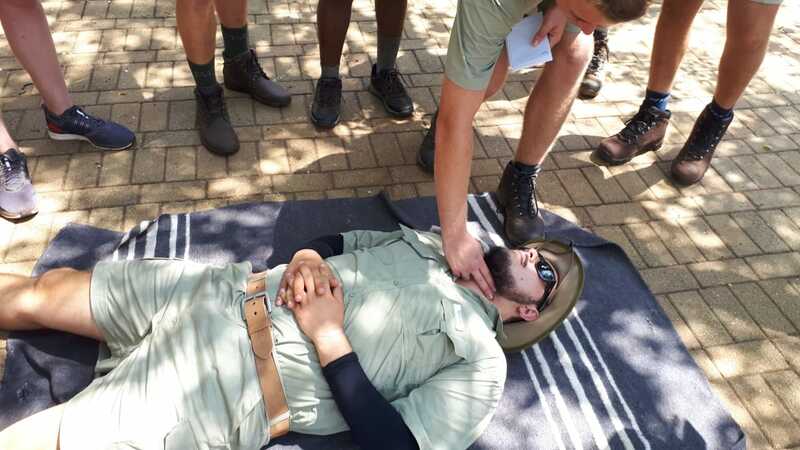 In dangerous game territories in remote areas, while working as Field Guides, we may be faced with serious injuries to guests and/or fellow staff members and knowing how to potentially save a life is reassuring. 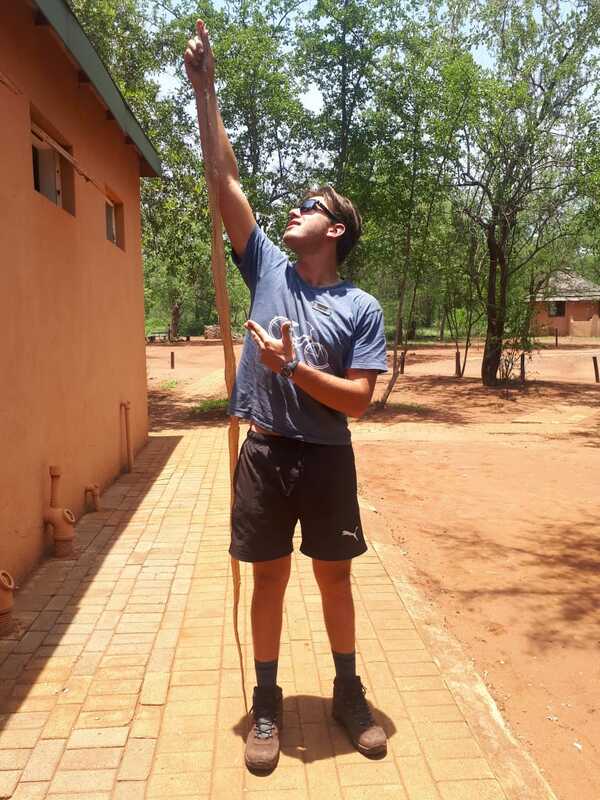 In only for few days, I have seen female leopard tracks, found the skin shed by a huge Black mamba, watched a slow creeping Puff adder after the rains and been impressed with the displays from our resident Ostrich named Oom Okkie. What a week of surprises indeed and this is just the beginning! Here’s to collecting good memories and doing lots of learning. I look forward to sharing my experiences with my girlfriend, friends, and family. I cannot wait for more action in the weeks to come in this hot Lowveld! Hi Daniël!Thanks for sharing.Make every moment count. Thanks Queen, we miss you!